We are always on the lookout for roses that will pack a punch in the garden as well as in containers. 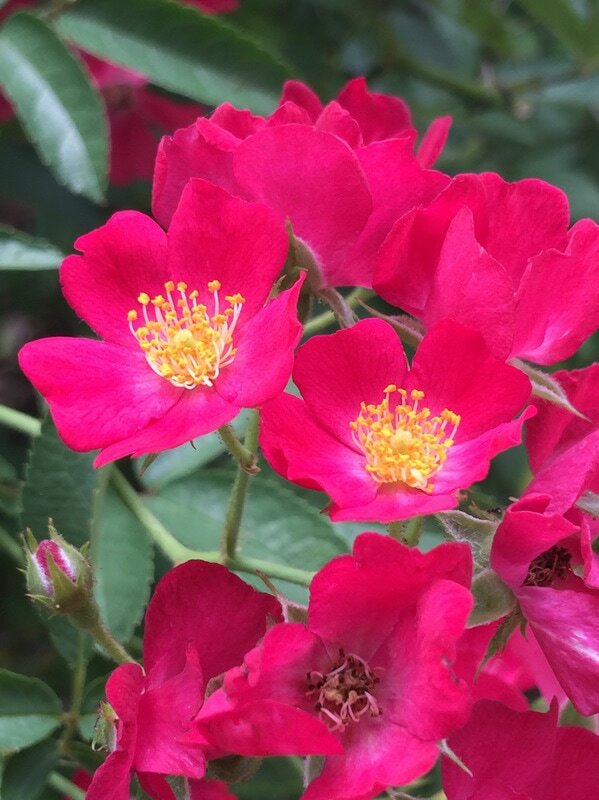 When Proven Winners sent us shrubs of 'Candy Oh', a rose in their "Oso Happy" rose collection, the description was filled with promise: "This is a sweet landscape rose with loads of perpetual blooms. Large sprays of single, candy apple red flowers bloom from summer until frost. This polyantha hybrid has a dense, mounding habit and is great for mass plantings. Bred by David Zlesak in Minnesota, it's very hardy and disease resistant." ​We decided to plant the shrubs in ten gallon containers to be used as anchors on either side of chairs in our garden. We planted one quart sized pot into their respective containers and set about to watch them grow. Well, can I tell you that after three years in our garden, our shrubs of 'Candy OH' are blooming like crazy! Thousands of tiny blooms like these cover the shrubs with virtually no disease. The shrub itself has a very pleasing growth habit and just needs slight trimming throughout the season to keep it in shape. I highly recommend this rose for garden and container use. It will give you a power punch of red blooms with bright yellow stamens. The blooms are small and bloom in clusters of 8-10, typical of its polyantha heritage. Mr. Zlesak outdid himself on this roses.